Outdoor living and entertaining is one of the most relaxing pursuits. You gather close friends and relatives, kick back and just chill. However, because a lot of that time is after sundown (especially as autumn comes on) it makes sense to be sure that your deck, patio, pool area and walks ways are all well lit. At Fifthroom.com we have solutions to your outdoor lighting needs that are not just practical, but are extremely attractive as well. Let’s start with your steps. Even if you only have a couple of steps from your porch or deck down to the yard, it is a really good idea to keep them lit up at night, and our Pyxis Step Light Kit will certainly do the trick. This system is low voltage for safety and comes in five different finishes to match your style. A good add-on for the step light kit is our Nebula Walkway Light. You can buy as many or as few as you need to make sure that guests can find their way around in the evening. 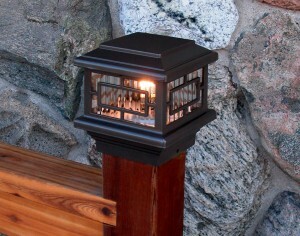 Like the step light kit, they come in a range of finishes to blend with the design of your home or deck. 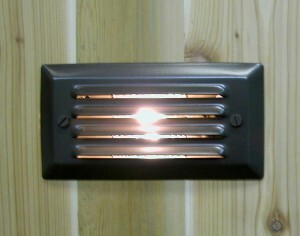 Post Cap Lights are a stylish way to dress up your outdoor room as well. Functional and beautiful, we offer a range of these fixtures which are made to sit atop most standard deck and fence posts. The Orion Cap Light features a long-life LED bulb which shines through a decorative geometric design and beveled-glass. 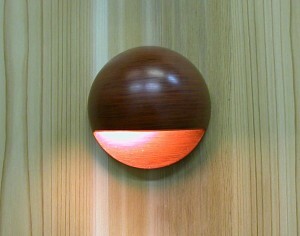 Another twist on post caps is the Nova, which features four LED bulbs at the corners of a distinctive milled wooden top piece. If you need to light up a larger area, there is nothing better than a ceiling fan with an integrated lighting fixture — but you have to make sure it is suitable for outdoor use! 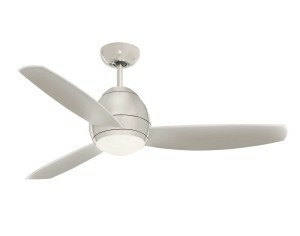 Our Avruc Ceiling Fan is just that. It features 6 speeds, is UL approved for wet locations and, best of all, has a remote control, so you never have to get up from your comfy chair! Lighten up as the fall season comes on and you’ll be able to enjoy your outdoor space for months.